Congratulations to Claire Battershill, whose book of short stories, Circus, published last year, was a finalist for the Danuta Gleed Award for best first Canadian short story collection. 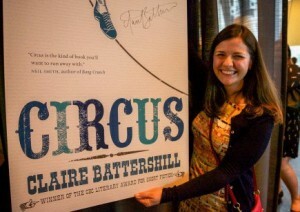 It has also won an award for best literary fiction by a new writer in Canada. This entry was posted in Department of English Literature news and events and tagged Claire Battershill, Danuta Gleed Award, Department of English, Department of English Literature, English Department, English Literature, Reading, University of Reading. Bookmark the permalink.